One of the popular and healthiest breakfast foods, Gothambu Puttu is made with wheat flour and grated coconut. That’s all it takes! Of all the varieties of Puttu available in Kerala, my favorite is this humble Gothambu Puttu aka Wheat Puttu. Usually served with curried black chickpeas, Puttu is also relished with ripe banana, beef or fish curry. Puttu and Appam are two Kerala dishes that are quite popular throughout the country. Staying in the Northern parts of India, I often get asked if I know to make these, especially our Olive Greens who love to relish traditional Kerala food any day. It is generally cooked in a puttu kutti vessel which has two sections. 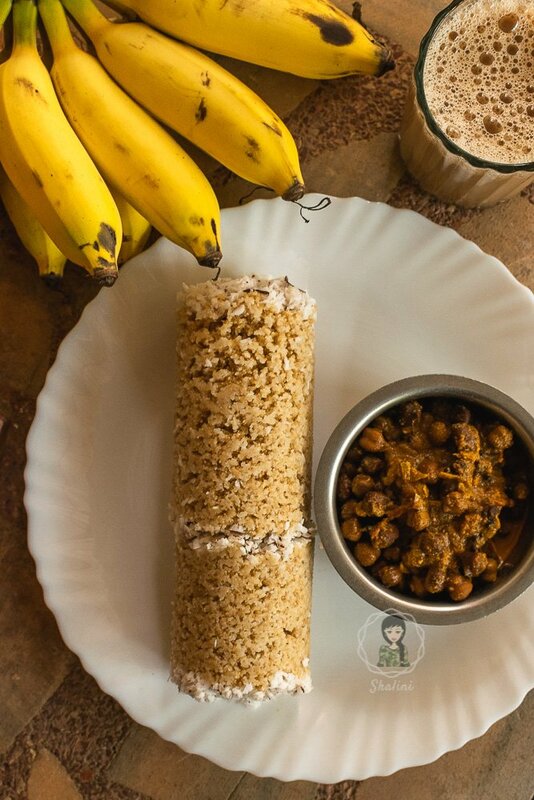 The lower part holds water used for steaming and the upper section (a cylindrical tube) holds the puttu — where the rice/wheat mixture is inserted in layers along with grated coconut. Perforated lids separate the sections to allow the steam to pass between them. This is then loaded atop the lower part which contains water. The puttu is done when the steam reaches and comes out of the top. 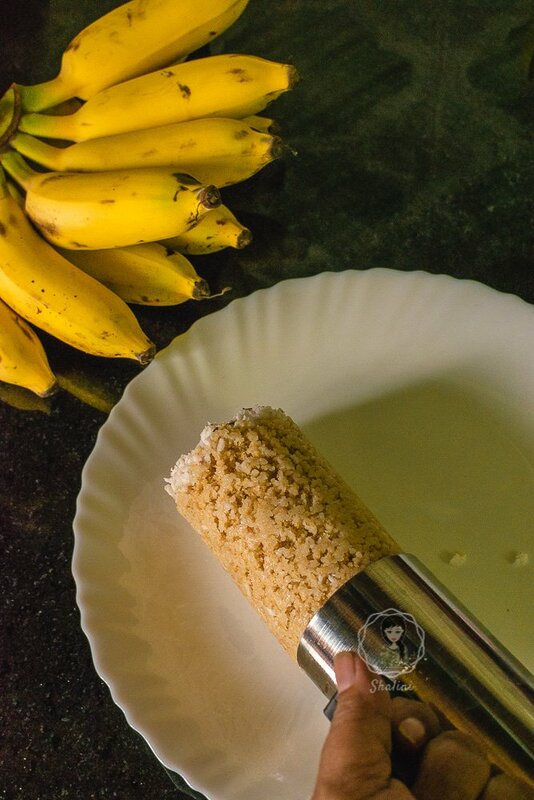 You can also load the cylindrical part atop a pressure cooker having water (where the whistle usually is) for the steam to enter the puttu mixture. Once done, you remove the cylinder, push the perforated lid from behind to place on a plate. Gothambu Puttu is best consumed immediately. So, here’s the recipe for a healthy breakfast option for those (like my husband) who prefers his Mallu breakfast over Oats or Corn flakes any day! One of the popular and healthiest breakfast foods, Gothambu Puttu is made with wheat flour and grated coconut. Dry roast wheat flour for a couple of minutes, stirring continuously. Remove and keep aside. Dilute water with a little salt. Say half a teaspoon salt to one cup of water. Add this water, little by little to the wheat flour to get a breadcrumbs consistency. You are only moistening the flour and not making a dough out of it. If any lumps is formed, pulse it in a food processor to remove any lumps. Fill the pressure cooker or the puttu mould with 2/3rd of water. In the cylindrical part, place the perforated lid at the bottom and fill a handful of grated coconut. Loosely fill the wheat mixture until half-full. Repeat the process. Cover and cook for 5-7 minutes after the steam comes out from the top. Remove and serve immediately with banana, chickpea curry, pappad, ghee and /or sugar. 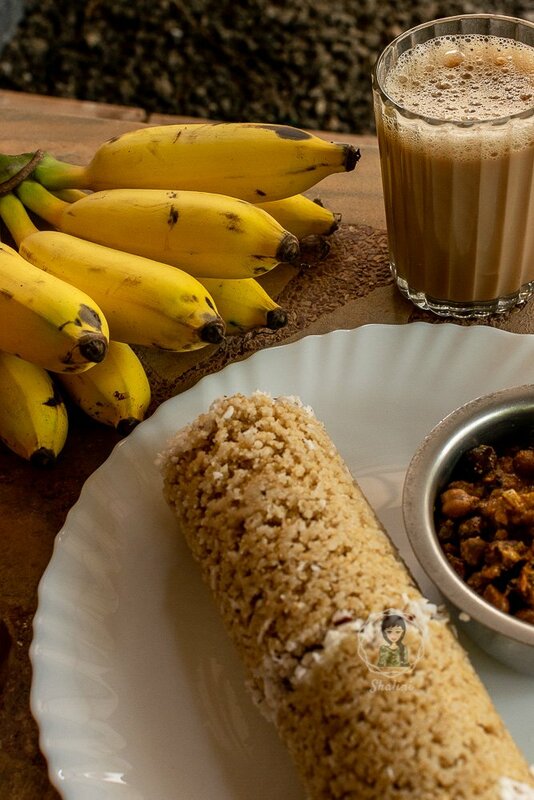 Have you had Puttu on your trip to Kerala? Have you tried making it at home? Let me know! Very healthy and interesting recipe. Can we make it without this special vessel, as would really like to try it. Surprisingly I’d never heard of wheat puttu. Puttu was always a rice dish according to me. Sounds like delicious dish though. I hope that someday I can try this out. I always fail at making Gothambu puttu though I do the rice, ragi, varieties. I see now I missed the whole procedure of lightly heating the gothambu. Ibhave onlybheard never got a chance to eat or make it. 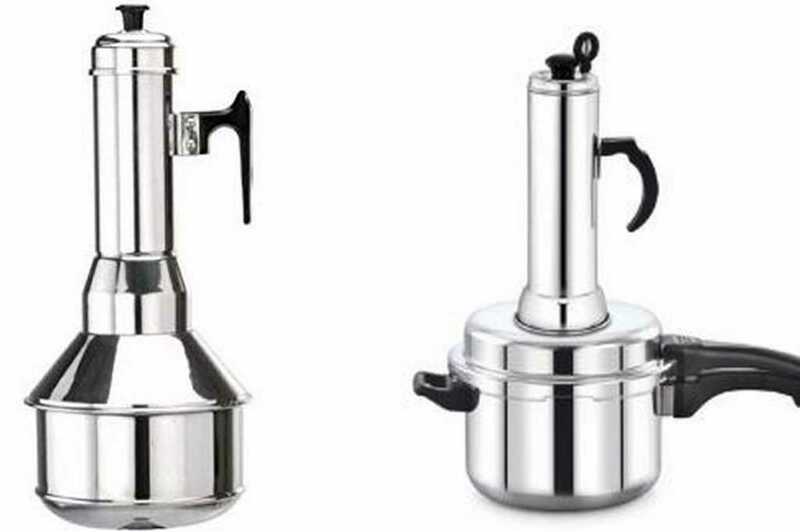 Is this puttu maker available online? Of course, it is! Try Amazon. 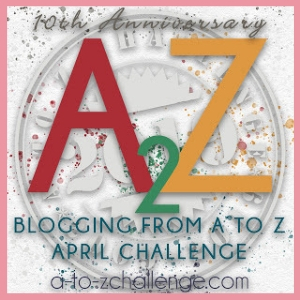 I have added an affiliate link in here. I have had the rice puttu in Kerala. It was delicious but I haven’t had this one. Lovely recipe and nice pics. The hard work put in is pretty evident. Nice healthy recipe. May be someday I shall get this made at home. Eat Puttu with beef / fish or eat fish / beef with Puttu? I shall skip chickpea and banana. This is awesome! My MIL makes Red Rice Puttu, and I love it! Using Wheat Flour would just give an healthier twist to it. 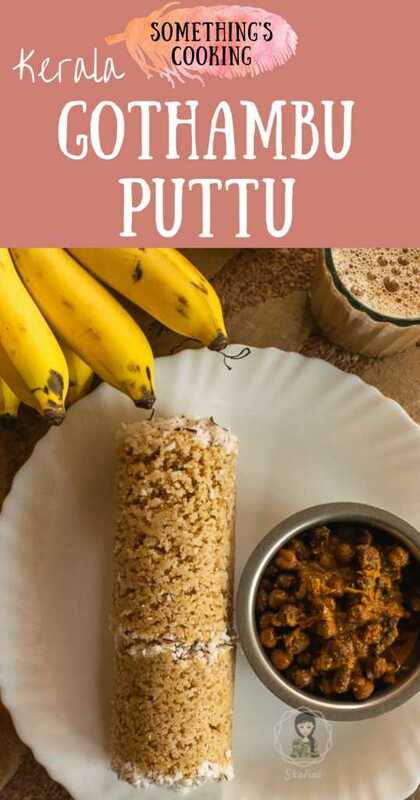 The Photo made me wish I could pluck the Puttu off the screen! 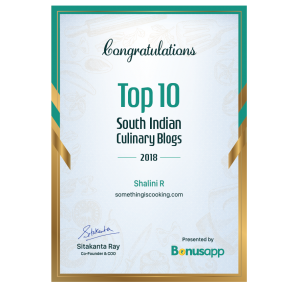 That sounds and looks delicious, Shalini. I was wondering about the fact that it looks like it has a crunchy outer cover. But that is not possible if it is steamed. Does it only appear that way? It is a healthy and tasty dish. I like it with sugar and banana. It’s always with bananas for me…and the small Kerala bananas. Yyuumm! Wow.. super. Best breakfast. I have couple of puttu recipes in draft yaar.